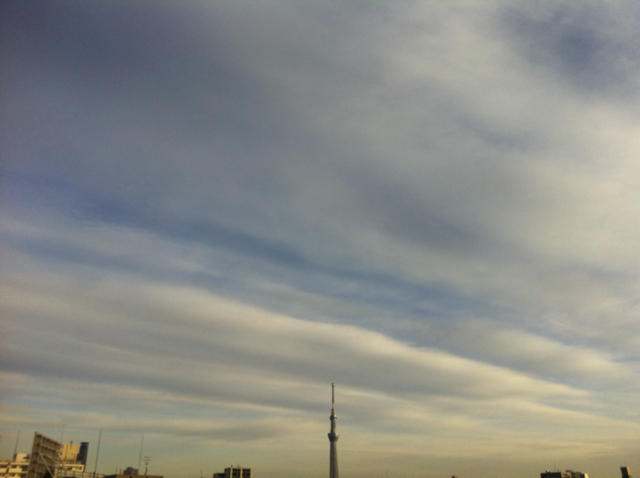 Fluffy white clouds stripe a blue Tokyo sky in the new year and set off the cold and steely Sky Tree, Tokyo’s newest quest for greatness: the tallest, sleekest, techiest tower of all. 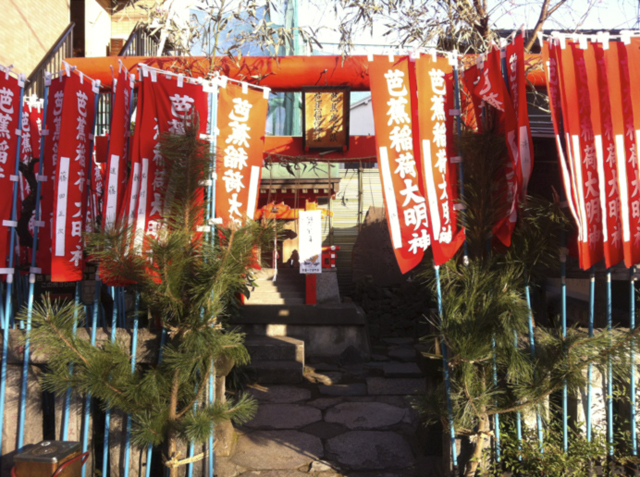 The New Year has been long in coming – traditional preparations have been happening everywhere. At the local bamboo merchant’s, they have been polishing and cutting and matching trunks of bamboo by the truckload. The resulting handsome kadomatsu decorations of cut bamboo and pine tied with decorative knots of rice straw rope are New Years’ works of art placed at the entrances of sumo stables and restaurants and other prosperous establishments. Inside too, preparations are underway for the New Year, including the last festivities of the year just finishing. Pounding rice to make O Mochi, a sticky rice cake eaten at the New Year, at a local Sumo Stable near our house. Despite the discouraging news that continues to emanate from Japan – slap dash cleanup of Tohoku, constant political musical chairs, collapsing highway tunnels, docks washing up on foreign shores, a more steady cultural heart beat continues to generate the country and keep it moving to older, deeper and less volatile rhythms. The deepest set of these is the New Year with its rituals of farewell to the old and beginning of the new. New beginnings, fresh starts, purification, all give heart and hope despite disappointments of the year that has passed. 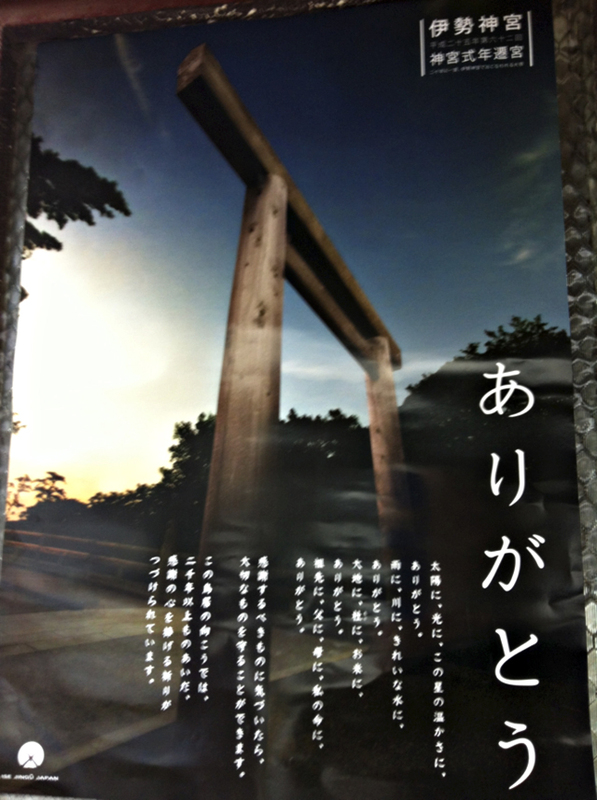 In Japan the New Year is a time for cleaning, beginning afresh, and purification. 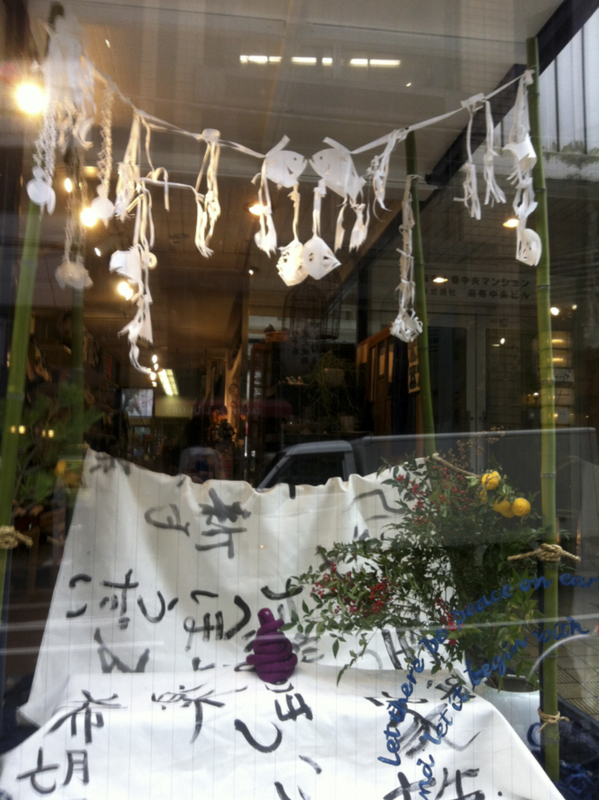 The first calligraphy of the year is celebrated along with the first mochi, the first flower, and the first tea. 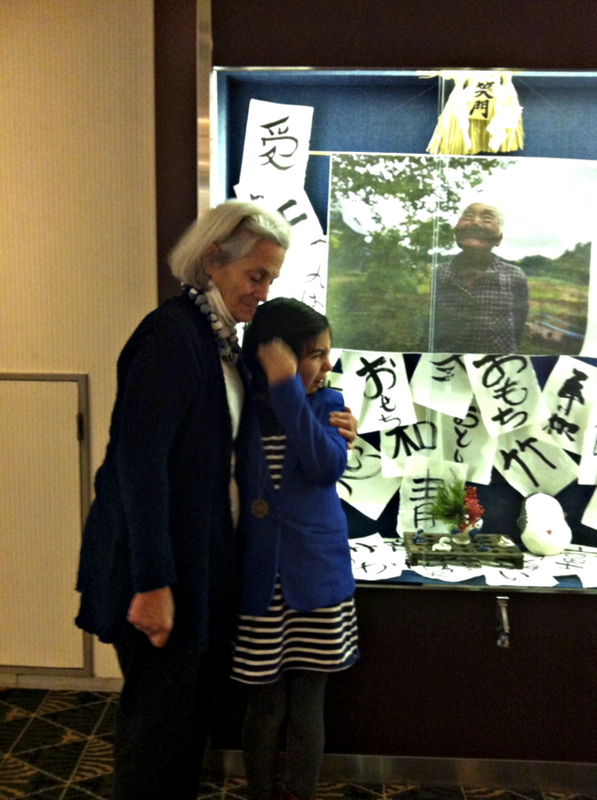 In the New Year window of Blue & White, 10 year old artist and student of Japanese in New York, granddaughter Ruby Momo brushed her own calligraphy images together with her grandfather on a swath of washi cloth. She helped hang them in the window of Blue & White on poles of new green bamboo with yuzu and pine and nandina from Wajima in Ishikaway Prefecture, under Shinto paper cuttings from Saitama Prefecture. Later she will hang her New Year’s calligraphy written on squares of old washi in the Blue & White window at the Hotel Okura. 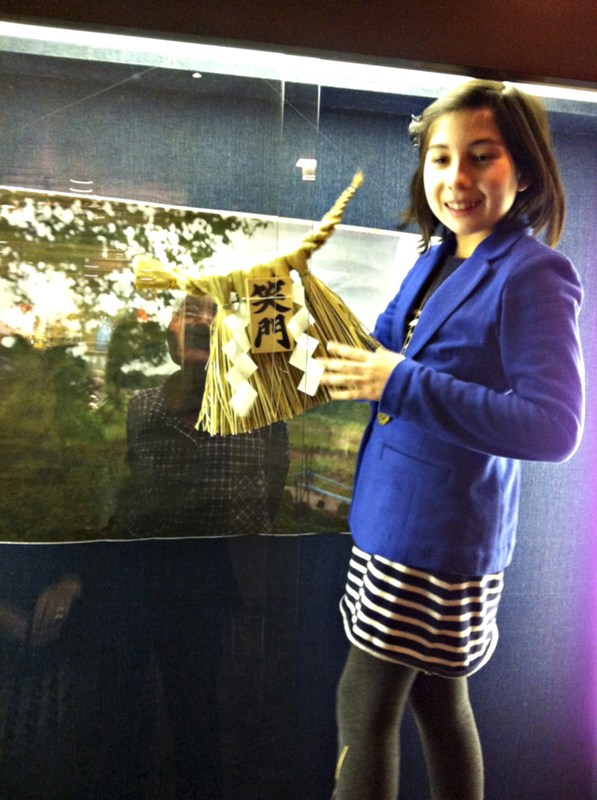 She was a perfect size to squeeze into the window to hang the Shime Nawa New Year’s decoration of twisted rice straw and sigzags of folded paper. 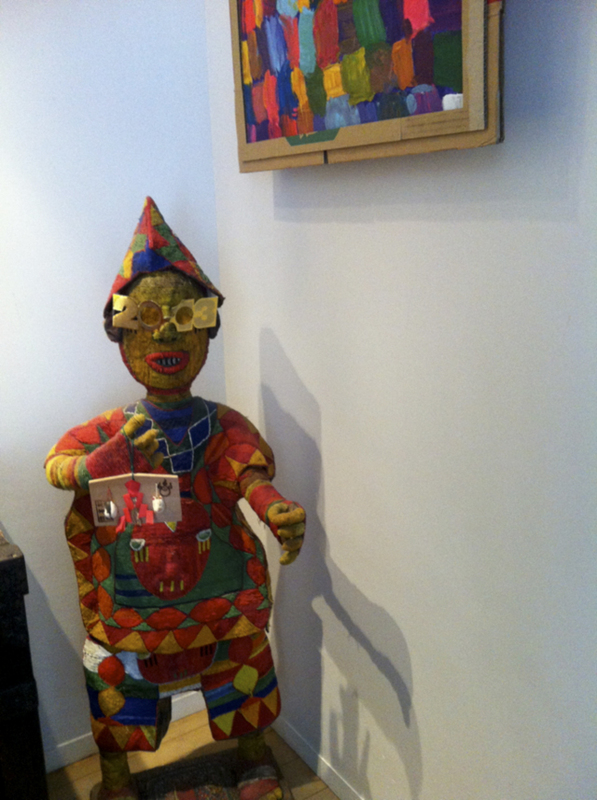 At home the New Year is taken more frivolously with 2013 glasses on the beaded African Yoruban Prince who welcomes guests. 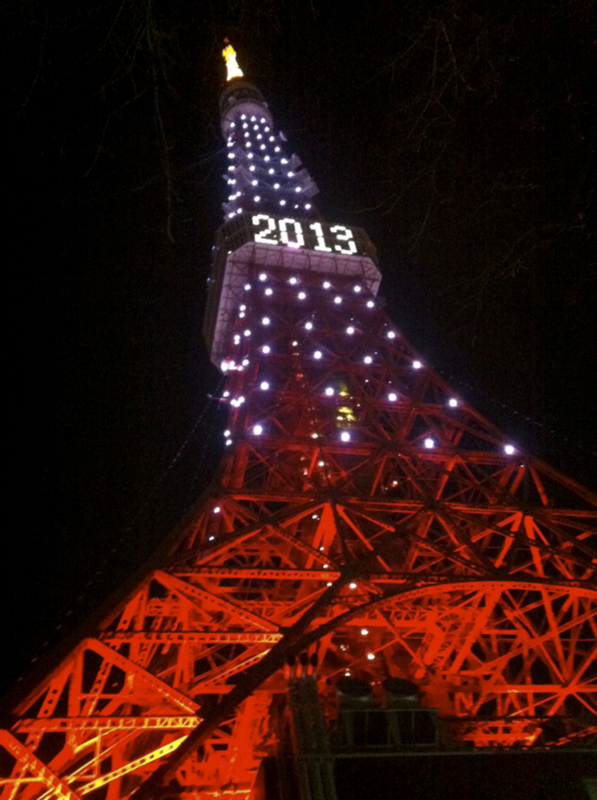 Tokyo Tower, graceful Grande dame, that she is, changes her outfit for every occasion. The New Year finds her lit in luminous orangey gold on some nights, and on others in an impossibly chic outfit of bright vermillion legs with sparky white lights on blue. She far out dresses the lackluster overnight sensation Sky Tree whose lighting is so subtle as not to be noticeable at all. 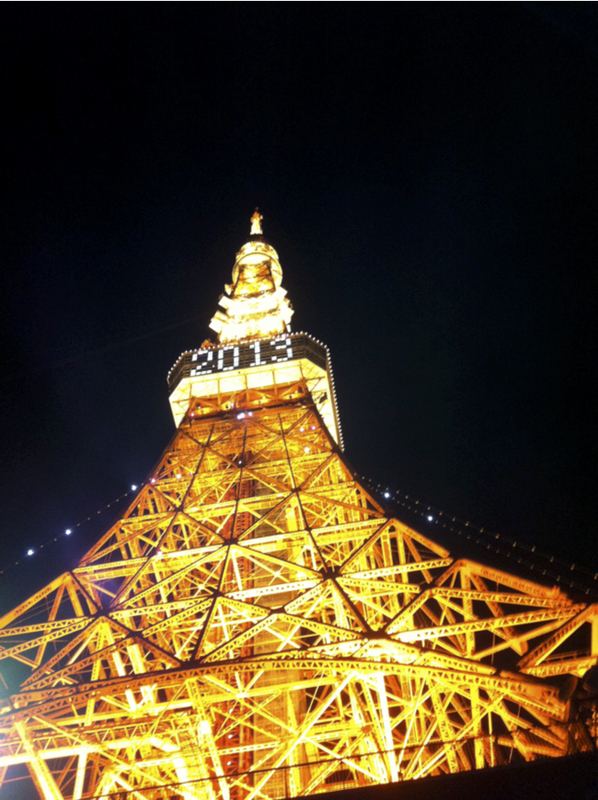 Tokyo Tower knows what it means to go all out to celebrate the New Year. And for all of it, there is gratitude. ARIGATO sign at the tiny O Deki Jinja across the road from our house reminds us to be ever grateful for blessings past and still to come. Some take time to play out, but all preserve an indwelling spirit of hope and reassurance of renewal of the Japanese New Year, the very CORE of Japanese culture. All are part of our Blue & White mindset. They inspire and give insight into the psyche of Japan – sometimes mysterious and ineffable, sometimes bold and playful – and its steadfast and unmoving core of culture. While the images above are not necessarily blue and white, they reflect the eternal wellspring of culture that flows up from deep within Japan. Some customs have changed and adapted to the present, some are inviolate. They all feed the Japanese spirit. They are the inspiration for Blue & White. We just got back from 2 weeks up at Hakuba and Shigakogen. Beautiful snow and a wondful holiday. The airline lost my bag on the way to Tokyo (ended up in LA!) so the morning I had allocated to come and visit, I ended up buying some clothes!! I’m sorry I didn’t manage to come in. Wunderbar as always, and we’re sure it is even more so with the help of Ruby Momo! It is making its way around the world filling everyone with delight! Many thanks & much love.